Do you know the world record for biggest squash ever grown? No? We didn’t either. Thank heavens for this new fangled thing called the ‘internet’. If you haven’t checked it out yet, please do. Anyway, turns out that the award goes to one Joel Jarvis from Ontario (read about lovely Joel here). His squash weighed in at almost 1,500 pounds which one news report equated to the size of a polar bear. Gosh, who knew? Joel says it was all down to lots of fertilizer and TLC. The prize-winning specimen – so we understand – gained up to 40 lbs per day. Which of course makes you wonder how they figured that one out. Did they drag the bathroom scales out to the veg patch every day? But I digress. Why you ask, this obsession with squash? Because dear reader, the season is upon us. Plant a squash plant – just one – and you’ll be inundated for what seems a lifetime. They grow exponentially (okay, maybe not like Joel’s but you get the idea) and if you turn your back on them, they go from cute wee things to the squash that ate Manhattan. 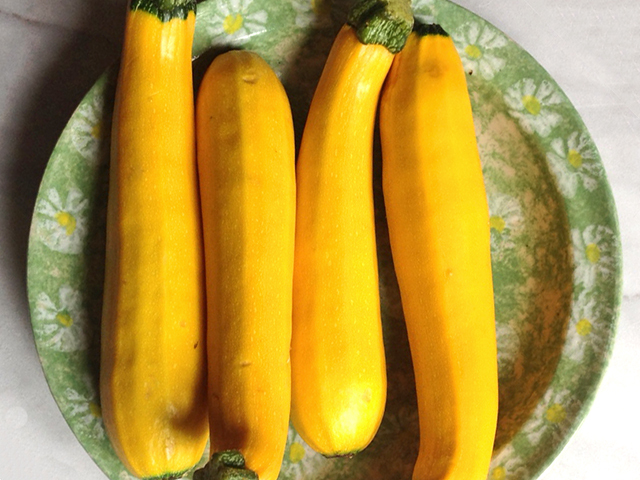 So as summer draws ever nearer, you’ll see people frantically searching their files for squash recipes. Remember Aunt Flo (she was the one with the rather heavy beard) and her zucchini bread? Get the ovens cranked up for that puppy. 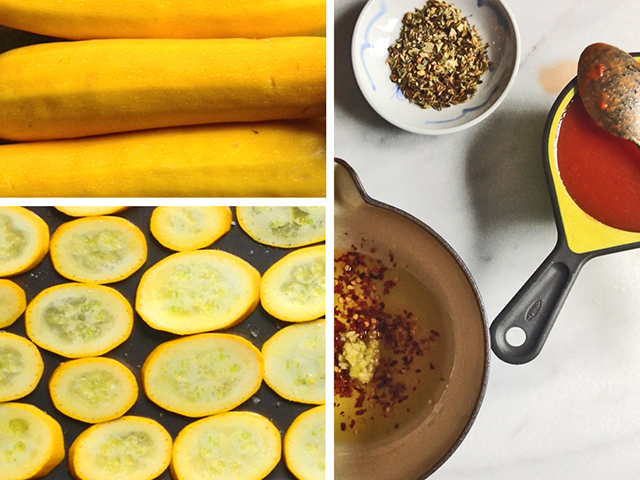 And how about that squash puree bake with cracker crumbs (on second thought, nix that one)? Or just let your fingers do the walking and go to that marvelous new thing, the ‘web’. We came up with – and we’re not kidding here – over 30 million hits in .22 seconds. Don’t you love technology? But to get you started, here’s an old favorite. Actually, it’s not that old. We just dreamed it up about 15 minutes ago. It’s quick, easy and you’ll be thanking us for the next 3-4 months. And if you are growing squash, consider setting up a sentry schedule with family members and loved ones to keep an eye out on your crop. You may not get close to Joel’s record but you’d be surprised what squash get up to when you’re not looking. Cut off the stem and tail ends of the squash and slice the rest into thin rounds. Brush two baking sheets with olive oil then place the squash slices on the pans and brush the slices with some of olive oil. Sprinkle with a bit of sea salt and place in the pre-heated oven. Roast until cooked through but not mushy – it shouldn’t take more than about 10 minutes. 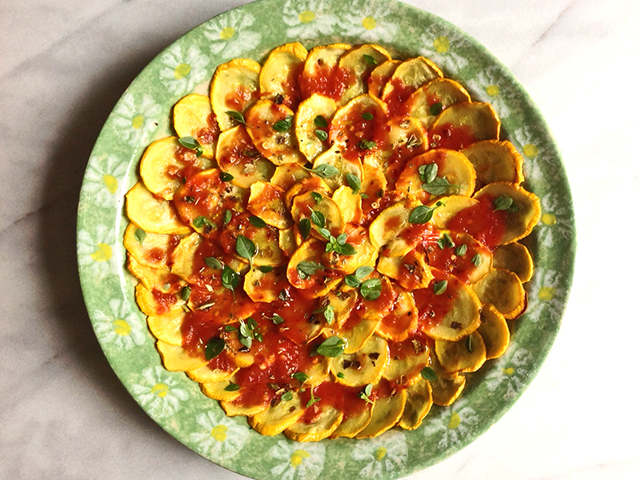 While the squash is roasting, make the spicy tomato sauce. Place the chile, olive oil and garlic in a saucepan and cook gently until the oil starts to sizzle and the garlic cooks slightly (watch it like a hawk because garlic loves to burn and burned garlic is a no-no). Add the tomato sauce and cook for a few minutes. Taste and add salt if needed. To serve, arrange the squash around a platter. Drizzle some of the tomato sauce over the top and place the rest in a serving bowl so folks can add more if they desire. Garnish with the herbs (if using) and Green Chile Caribe and serve. This is also mighty tasty with the additional of a bit of goat’s cheese or cubes of feta on top.